Why should you care for your tent? Cleaning and waterproofing your tent will ensure that it lasts longer and performs better in the elements. Exposure to UV rays and the elements can be devastating to your tent. 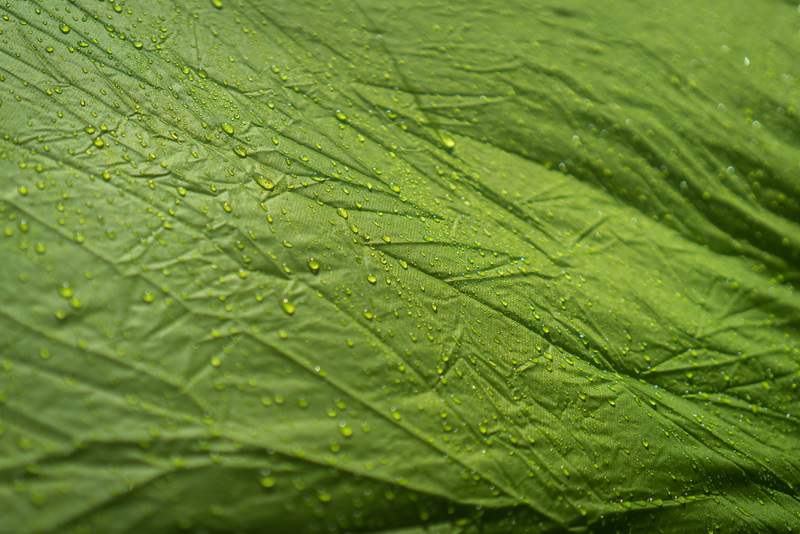 Simply two weeks of UV exposure may lead to a 50% reduction in the tear strength of your tent’s fabric! Also, over time, dirt and dust build-up will attract water to the tent fabric, making it absorb water. 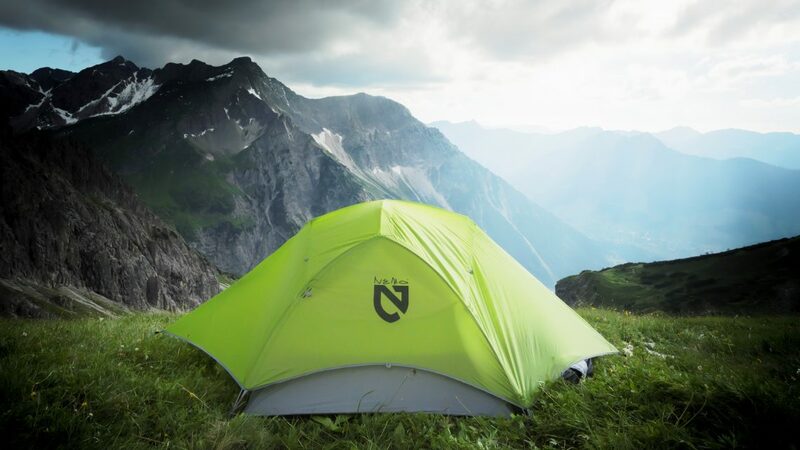 If you notice your tent is no longer repelling water, treat it with Tent & Gear SolarProof. Tent & Gear SolarProof provides superior waterproofing and also doubles the useful life of fabrics by protecting against UV damage. Tents are best cleaned, waterproofed and UV protected when pitched. Never machine wash or tumble dry them! Place the tent in an area that will drain easily and is free of excessive dirt or dust. Spray Nikwax Tent & Gear SolarWash evenly over the outside of the fabric. Rub in well with a damp sponge or cloth, paying attention to excessively filthy areas. Allow to dry naturally (if not applying SolarProof). Ensure it is completely dry before packing the tent away. Don’t forget to sweep/ shake out the inside of the tent. Apply the Tent & Gear SolarProof to a wet, clean tent ensuring that you pay particular attention to any seams. Wipe away any excess with a clean cloth. Then go check out THIS VIDEO! NEED TO CLEAN OR WATERPROOF OTHER CAMPING GEAR? As big fans of waterproofing pretty much any piece of gear, we really appreciate this quick and easy article on tent maintenance. Just curious, we review dry bags and other waterproof stuff at whopperduffel.com and were wondering what Nikwax product would be best suited for a DWR for a dry bag or dry sack? Thanks! Thanks for the kudos. If the dry bag has an outer material that uses a DWR coating, we would recommend Tent & Gear Solarproof! Excellent! Very much appreciated. Especially since we’ve recently relocated to an extremely wet climate. We are excited that your products are readily available here! I tried washing my Eureka mildew tent with full strength, Nixwax tech wash while it was set up. No luck getting rid of the stains. I then put the tent and fly in the bathtub with warm water and 300 ml or the whole bottle.. rinsed it.. no luck with the stains. Mildew is a real bugaboo to get rid of. We have heard that using a vinegar mixture and a soft bristle toothbrush can help. 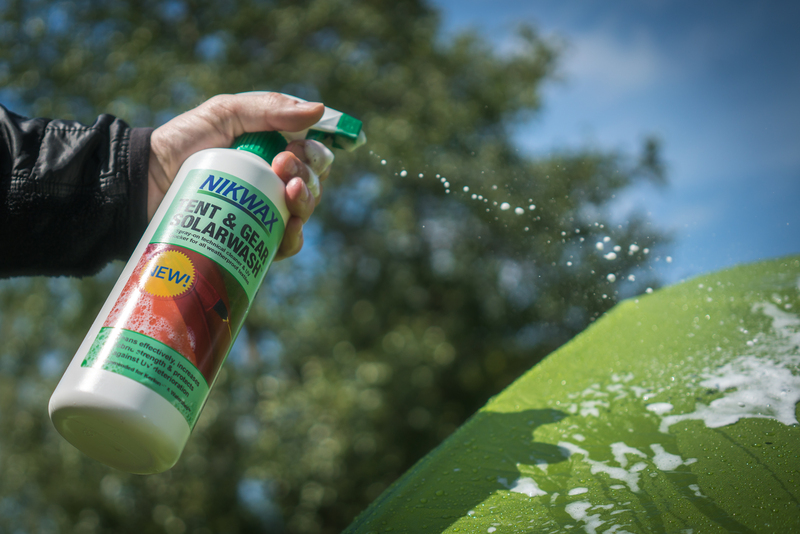 Once you treat the mildew, you will want to clean your tent with Tent & Gear SolarWash (however, if you still have some Tech Wash leftover you can use that in a pinch). This will get rid of any residues that can be detrimental to the tent’s water-repellency. Then, re-waterproof with Tent & Gear Solarproof. Make sure to always let your tent dry out thoroughly before putting it away. 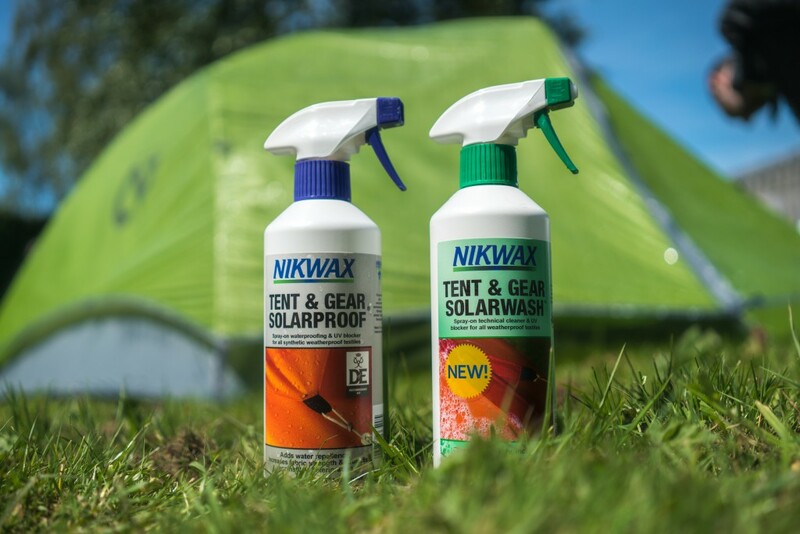 If you have used Tent & Gear SolarWash or SolarProof, you can safely leave your tent out in the sun without fear of UV damage! What solution do you have for large fixed outdoor tents? Hey Maino! Depending on the size of the tent you are referring to, you may have to purchase 1-3 bottles of Nikwax SolarWash, to clean the entirety of the fabric. SolarWash only comes in 500ml size bottles. That’s typically enough to cover an entire standard camping tent, at least once. For waterproofing, you could place an order with us (email: inquiries@nikwax.com) for a 1 Liter or 5 Liter jug of Nikwax SolarProof. It comes in those larger sizes. How to Clean Sandals and Next-to-skin Footwear!